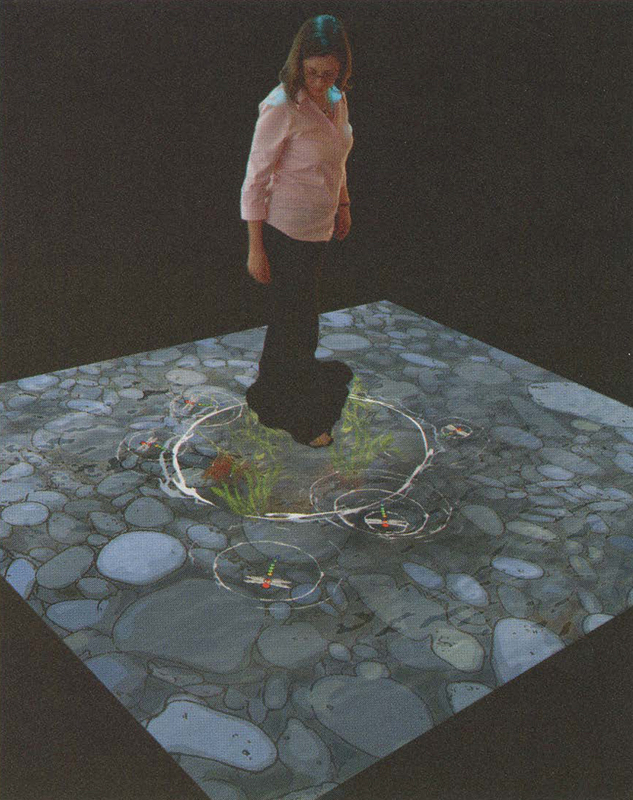 Moderation was inspired by the forest-spirit scene in Hayao Miyaza­ki’s movie “Princess Mononoke.” Participants walk onto a projected image that shows water gently rippling over river rocks. The first step generates a circular ripple around the participants’ feet, and subsequent steps generate a flowering of colorful flowers as water spirits dart about. As participants step away, the plants wither and brown, leaving a trail of flotsam. After the initial interaction, most par­ticipants react by running quickly to make more plants and creatures appear. However, if the participants do not moderate their demands of this magical pool by responding to the cue of a dimming image, then the pool fades completely, leaving them bereft. This relation­ship metaphor demonstrates that good relationships are maintained by careful observation of what one’s partner can reasonably deliver and appropriately moderating one’s requests to that expectation. This lesson applies to our relationship with the environment and our friends, lovers, children, and colleagues. In this work, I have extended the infrared touch-screen technology presented at SIGGRAPH 2004, which used multiple, diffuse infrared light sources cast from oblique angles. In this case, the image­ processing system detects where a participant is standing with high accuracy. In other similar overhead-projection tracking systems, an overhead camera can not determine the exact position of the feet because the body obscures the camera’s view. In this installation, the camera is mounted obliquely so the feet can be located with precision without interference from the upper body. Many well-known image-detection and filtering algorithms are ex­ploited in this work, all coded in custom C/C++. Because the camera is not coaxial with the projector, calibration algorithms are necessary to correlate camera space to screen space. All hardware compo­nents are off-the-shelf.